Jumpers and sweatshirts are some of the most comfortable forms of sportswear available. You can be sure to create much exposure for your business by distributing these promotional hooded sweatshirts, jackets and jumpers to your clients. We stock promotional clothing made from comfortable and long wearing fleece, lycra, yarn, cotton and polyester. All clothing featured here is unisex, allowing them to be worn by both men and women. All of the clothing in this category can be customised to align with your company by choosing the style, colour and having your logo applied to the front. A customised jumper, printed with the design of your choosing, will help your customers to feel warm and comfortable, ensuring they associate that warmth and relaxation with your business. Convince with trendy hooded jumpers, cozy sweaters and casual pullovers! 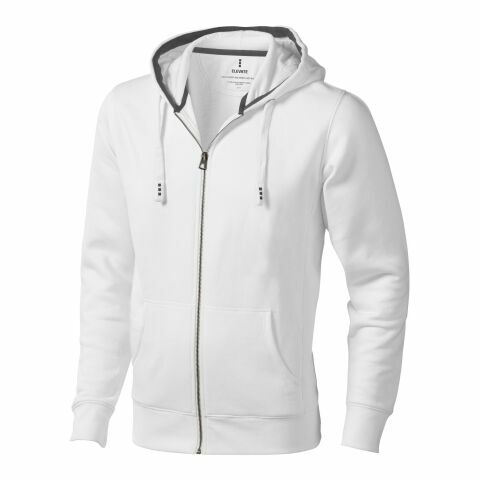 Sweatshirts and jumpers are usually associated with relaxing at home, comfort and leisure. Let these positive words be attributed to your business by distributing logo printed sportswear . Thanks to allbranded you now have the opportunity to pamper your customers with exactly such items! Custom printed Sweatshirts & Pullovers, with a funny advertising slogan or your company logo, will show your client base just how important they are to your company. In our web shop you will find styles in abundance, there are trendy hooded pullovers, cozy sweaters, jumpers with drawstring hoods, scoop necks, button down cardigans and casual pullovers, just to name a few. These come in a range of materials such as fleece, cotton and polyester, and are all unisex. No matter what your marketing aim, there is sure to be a style to suit you. promotional products have the ability to put focus and attention on your company. These items in particular are effective in doing this due to their usefulness. The more useful a product is, the more someone will use them and the bigger exposure you’ll create for your business. A promotional jumper can produce as many as 1,843 brand impressions in its lifecycle. These two factors are crucial for the life of your Products. Recipients are likely to keep these practical products for many years, during this time, the printed sweater can make your logo remain in the memory of your customers, employees and business partners. Advertising placed on top of the clothing is especially striking, as they will be at the approximate view height of bystanders. This promotional leisurewear can be great advertising among many different target groups. So both customers, employees and business partners can look forward to this fashionable advertising gift. These would make thoughtful and well received gifts for Christmas or specific corporate events. You can also use them as creative gifts for birthdays. Surprise your target groups and strengthen your business relationships in a very innovative way. As uniform or very casual work clothes, the sweaters, jackets, custom printed T-shirts and caps from the allbranded Online Shop will improve team cohesion and trigger a sense of belonging within employees. Having your employees wear the same uniform will not only improve their sense of team spirit, but help customers to recognise who to find when they have questions. The wide assortment of promotional Products in the online-shop offers hooded sweatshirts, pullover jumpers and jackets, button down cardigans, as well as several garments for children. Once you have chosen your preferred style and colour, you can have your corporate design applied, either though screen printing, flocking or embroidery. Convince yourself of the positive effects of this fashionable advertising medium and order sportswear online for your customers, employees and business partners!